While cooperation between China and Russia looks to be at its strongest since the Sino-Soviet split, it is extremely one-sided, benefitting China but offering little to Russia in return. The natural counterweight to China is Europe and Russia working together. To restore its strength, Russia must shift back to a course of engagement and friendship with Europe. 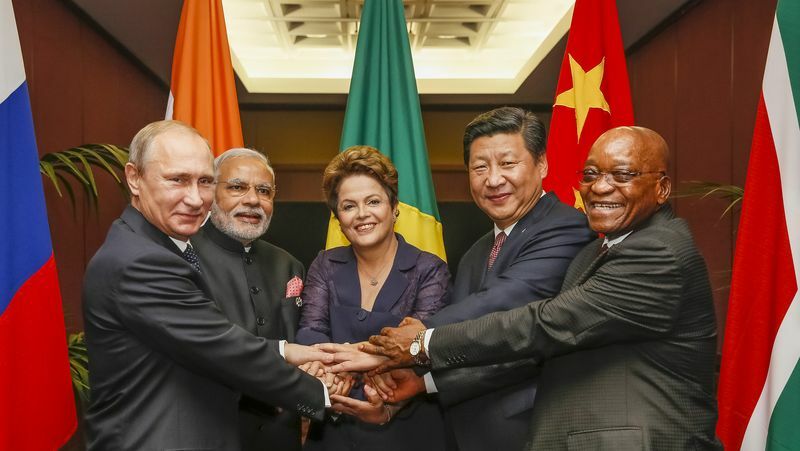 China President Xi Jinping and Russia President Vladimir Putin along with other BRICS leaders, November 2014. Jack Goldstone is an expert on revolutions at the Woodrow Wilson Center and George Mason University and a global fellow at PS21. He is the author of “Revolutions: A Very Short Introduction.” Follow him on Twitter at @jgoldsto. President Xi Jinping of China has been offering his countrymen a vision of China’s future that he labels the ‘Chinese Dream.’ This future China will be prosperous, respected, and environmentally sound; it will be influential and admired for its accomplishments in creating a harmonious, stable, and well-off society. In pursuit of these goals, Xi has cracked down on corruption, elevated the importance of environmental regulation and quality of life over simple pursuit of maximizing GDP, and sought to encourage China’s leadership in regional development through new institutions like the Asian Infrastructure Investment Bank. Xi has also sought to increase China’s influence in the region and the world through its role in international organizations like the BRICS, ASEAN, and the Shanghai Cooperation Organization. Russia would seem to share much the same dream. President Vladimir Putin speaks of creating a Russia that is prosperous, influential, and respected. Russia and China also seem to share a political vision. Rejecting Western notions of multi-party democracy and separation of powers, both countries have leaders who believe that strong individual leadership and centralized authority, with no role for an active organized opposition, is essential to preserving stability and reaching their goals. So it seems natural that China and Russia should become close partners. With similar visions, couldn’t each help the other achieve their goals? The recent deal between China and Russia for long-term supply of natural gas to China seemed to mark a new era of cooperation between the two nations. With visions of a new trans-Siberian high-speed cargo line that would allow Russia to serve as a major transit line between China and Europe, the opening up of Arctic sea lanes that would provide another global east-west link, and cooperation on a host of international issues, from containing Iran’s nuclear ambitions to fighting Islamic terrorism, Russian-Chinese cooperation would seem to have entered its strongest phase since the Sino-Soviet split. Yet these appearances are deceiving. The cooperation between Russia and China is extremely one-sided, benefitting China but offering little to Russia in return. All the leverage is on China’s side, and indeed China looks set to get stronger while Russia grows weaker. For Russia to hedge its bets on a Chinese alliance is extremely ill-advised, as helping China achieve its dreams may produce the opposite effect in Russia. Russia would like to return to its days of being a superpower, or at least being a major power in a multi-polar world, regarded as an equal of Europe, China, and the United States. No doubt Russia is their equal in its contributions to world music, science, and literature. But if one looks at demographic and economic relationships, it appears that Russia is out of its league. Russia has finally resumed population growth, driven by improvements in fertility and mortality. Its population today, including that of Crimea, is almost 145 million. Yet this good fortune likely will not last. Fertility was boosted by prosperity and generous government programs; with lower oil prices and Western sanctions limiting economic growth, fertility is likely to stabilize or decline. Given that the women now coming into their prime child-bearing years are those of the exceptionally small cohort born in the post-Soviet crisis years of the early 1990s, birth rates are certain to fall. At the same time, economic distress and looser rules on sales of alcohol will likely see mortality rise again. The drop in value of the ruble has also made working in Russia less attractive to labor migrants. Putting all of these trends together, Russia’s population is likely to decline again in the coming decades, falling to perhaps 130 million by 2030. To the west of this modest-sized Russia (about the same in population as Mexico or Japan today) would be a European Union with 465 million inhabitants, and to the east, China with 1.4 billion people. Thus the European Union and China will likely, by mid-century, have 14 times the population of Russia. In terms of their economic output, according to the International Monetary Fund, the GDP of the EU today is $18.5 trillion, adjusting for purchasing power parity (PPP). That of China is $17.6 trillion. Together, they have economic output of $36.1 trillion, or 10 times the economic output of the Russian Federation ($3.56 trillion). Even if China’s growth slows to 5% per year from its present 7%, it is likely to continue to grow more rapidly than Russia; by 2030 it seems likely that the combined economic output of the EU and China will also be 12 to 14 times as large as that of Russia. In short, Russia is facing overwhelming odds in trying to position itself as a third ‘polar power’ in Eurasia between Europe and China. It is as if Japan tried to be a third major co-equal power in the Pacific between China and the U.S. It is simply not sustainable. More likely Russia will be squeezed between the much larger and economically mightier regions of the European Union and China. One can see the difference in strategic positions in the approaches being taken by China and Russia on the world stage. China is firm in expressing its territorial ambitions, especially in the South China Sea, but has so far avoided any overt conflicts. Instead, it has tried to win influence over its neighbors by offering investments, trade agreements, and institutions. It has embarked on a massive campaign against government corruption, and signed an important agreement on climate-change gases with the United States. By contrast, Russia has found itself engaged in wars across its borders, first in Georgia and now in Ukraine, that have cost it international goodwill and millions of rubles but have brought few benefits. Russia has little in the way of investments to offer other nations; instead it is struggling to limit capital flight to save investment capital at home. Instead of agreements to broaden its trade, it has responded to Western sanctions by further restricting imports. Instead of cracking down on corruption and supporting international efforts on climate change, Russian business and government corruption remains largely immune to requirements for transparency and probity. And while the U.S. and China are assuming leading roles dealing with global climate change, Russia sits on the sidelines, its government and economy still heavily dependent on the sales of fossil fuels to countries that are in fact doing all they can to cut back on their use. These differences reflect a simple truth: China is able to approach its dealings with the world from a position of strength while Russia is dealing from a position of weakness. As stated, the Russian Federation will not be able to act independently as a third major power on the Eurasian continent – its population and economy are far too small, and its dependence on natural resource sales and unchecked corruption render it more and more like an under-developed nation, rather than a modern scientific and industrial one. If Russia becomes mainly a natural resource supplier and transit hub for China’s massive economy, Russia will be ever more dependent on the ups and downs of China, and the whims of its leadership. Down this path lies loss, rather than gain, of Russia’s autonomy and security. So where can Russia turn to restore its strength? Oddly enough, the logical answer is to Europe. Together, Europe and Russia would be a reasonable counterweight to China in both population and economic might. Europe and Russia working together would span the entire Eurasian continent, and like the United States would be both an Atlantic and Pacific power. Russians are, despite their proud and independent culture, mainly European – Russian art, culture, literature, and religion are solidly within the European family, respected and admired for their contributions to Europe as a whole. Yet instead of taking its natural place as one of the leading powers within Europe, Russia has essentially gone to war with Europe over the issue of allegiance and influence in Ukraine. This conflict over a small and economically modest nation (Ukraine’s economy of $370 billion, PPP-adjusted, is smaller than that of Peru or Romania) has moved Russia further away from full engagement with the multi-trillion dollar economy of the European Union. Of course, Russia’s long association and feelings of kinship with Ukraine have led to Russia’s military engagement there. But in the long run, this conflict, like that in Georgia, simply moves Russia further away from the logical position in which it would have its greatest economic and political strength, and that is through closer engagement with Europe, not conflict and separation. If Russia is to win the world’s respect and admiration, it needs to return its economy to growth, reduce its dependence on natural resource exports, limit corruption, and open its economy to greater competition. Selling ever more raw materials to an ever-more-dominant Chinese economy will not achieve these goals. Instead, internal reforms, making peace in troubled regions, and seeking to take advantage of opening and further engaging with Europe are the ways that Russia can restore its strength. The world has changed, and the Russian Federation will never play as dominant a role in global affairs as did the Soviet Union in the 1950s and 1960s. At the same time, the Russian people should never again suffer from conflicts as they did in the Second World War. Moreover, with the advance of Russian technology and skills, the Russian people have every reason to expect that even in a smaller Russian state, they will achieve new heights of prosperity and security. France and Britain are no longer superpowers, and Switzerland never was (except in watch production), but the quality of life their people enjoy today is something that Russians would gladly enjoy as well. Russia’s strongest future is not as an isolated nation, but enjoying its status as one of the largest and most powerful countries within Europe. To fully realize that future, however, Russia will have to shift back to a course of engagement and friendship with Europe. The sooner that takes place, the better for Russia and its people. This piece originally appeared in the BRICS Business Magazine English Edition No.6(10).